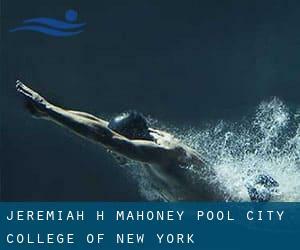 Jeremiah H. Mahoney Pool - City College of New York is only one of all the swimming pools Swimia is offering you, and its details has been shared with us by a swimmer like you.Recall you are able to now promote Jeremiah H. Mahoney Pool - City College of New York by sharing this page together with your friends, adding comments and linking to us. This sports center provides 25 yards, 6 lanes, Indoors. Take the #1 Train to 137th St. Walk 1 block east on 138th to Amsterdam, then one block through the campus (down the hill) to Convent Ave. The Marshak building is the long, low building in front of you; get directions to the pool from a security guard. Updated on 2019 39 Whitehall Street , Financial District , New York , NY , USA (Postal Code: 10004). Among all the activities offered by the center, if you're interested in swimming you'll enjoy 60 feet, 2 (wide) lanes, 3 feet - 5 feet depth, Indoors. If you might want to make contact with this Swimming Pool, email address and phone number are both number. 533 W. 59th St. , Hell´s Kitchen / Columbus Circle , New York , NY , USA (Postal Code: 10019). Among all the activities supplied by the center, should you be interested in swimming you will enjoy 20 yards x 35 feet, 4 lanes, 8 feet depth, Indoors. Just in case you wish to get in touch with this Swimming Pool prior to dropping by, we only know the phone number. 344 E. 14th St. , New York , NY , USA (Postal Code: 10003). Among all the activities provided by the center, in case you are keen on swimming you'll enjoy 20 yards x 25 feet, 4 lanes, Indoors. If you need to get in touch with this Swimming Pool, email address and phone number are both number. 430 West 25th Street (between 9th & 10th Avenue) , Chelsea , New York , NY , USA (Postal Code: 10001). Among all of the activities offered by the center, for anybody who is enthusiastic about swimming you will enjoy 25 yards, 6 lanes, Indoors. Just in case you need to contact this Pool before dropping by, we only know the phone number.